Mechanical removal of undesired vegetation can be completed with the use of a rubber tract skid steer machine equipped with masticating head or IRM crews utilizing chainsaws or mechanical implements to remove weeds. Restoration crews range in size from 2 to 20 individuals, and often utilize multiple tools between the crew. As described below, each of these techniques has their particular advantages. Mastication: Ideal for dense, large, relatively gentle sloped areas with little understory vegetation (e.g. blackberry and Scot’s broom thickets). Chainsaw Removal: Ideal for woody invasives (e.g. blackberry and Scot’s broom thickets), that are on steep slopes or scattered across the landscape. Weed Eater: “Weed wackers” can be effective for reaching smaller patches of invasives in areas where the Lightfoot cannot access. Metal Blade Weed Removal: Ideal for smaller-stemmed invasives that are less dense and ensures that treated stems are close to the ground. 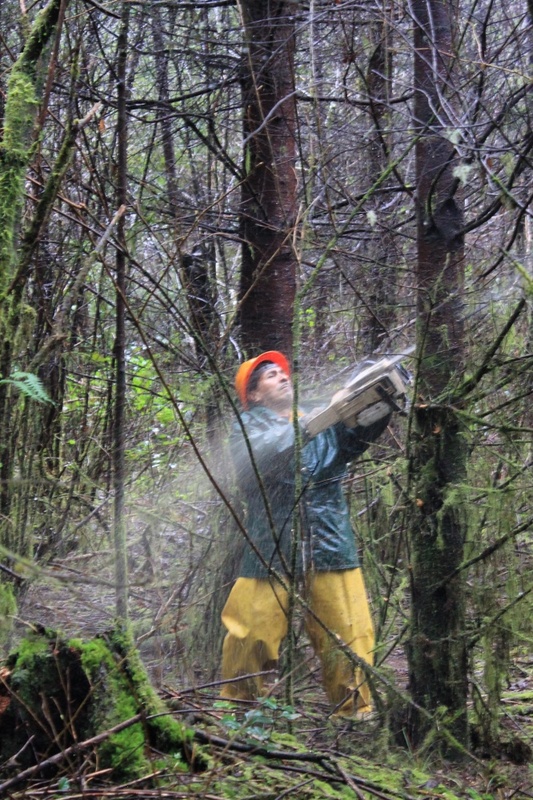 Please contact Habitat Restoration Coordinator Matt Mellenthin or 541 929-3408. Visit our Projects: Terrestrial Habitat Restoration page for examples of Mechanical Vegetation Treatment Projects completed by IRM.